Oh the memories. This picture reminds me of the tired excitement of those last weeks… And the walking every isle of Costco for exercise on a rainy February afternoon. Thanks, Husband. As friends prepare for maternity leave, I cannot help but reflect on those two short weeks I spent at home before E. arrived. In some ways, they felt like an eternity, while in others they weren’t nearly long enough. 1. Don’t agonize over how much time to take from work before your due date. California offers four weeks of pregnancy disability, take the four weeks. I went into prodromal labor (a very long, slow labor) with E. three weeks early and had her 12 days before she was due. 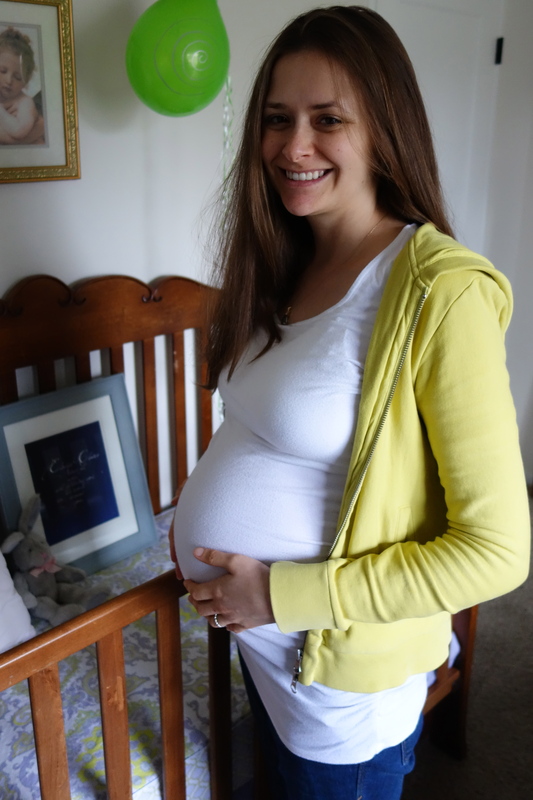 Originally, I had planned to work until two weeks before my due date. So glad I didn’t. There would have been no break and I was already exhausted in the classroom when I left. 2. Make your pre-baby maternity leave about you. After the baby is born, you won’t often have the luxury of slow showers, long mornings in bed, etc. Even if you are anxious for that little bundle to arrive, force yourself to spend time to yourself. Get your hair cut, indulge in a massage, do whatever you enjoy on your own. 3. Don’t forget your partner. Go on a couple dates, take long walks together, snuggle up on the couch and watch TV. After baby, you will have to work a lot harder to make those moments happen, (especially when you are also competing for time to yourself for basic things like showering and eating). 4. R-E-L-A-X. Watch TV, snack, and nap without guilt. There will be more than enough to do soon and you don’t know when you will need that burst of energy for labor. Get in every restful moment you can, even if it means sleeping during the day in your recliner in the living room. 5. Stop worrying about whether or not you have every item you need for baby. Believe it or not, Amazon will still be waiting for you with two-day delivery and there will (hopefully) be plenty of people in your life willing to run to the store if you need something sooner. Do have a speedy thermometer, though. That’s one thing you don’t want to have to rush to the store for when you have a sick baby and an advice nurse insisting on a rectal temperature. 6. Eat well. You are about to run a marathon. If you eat crap, you may feel like crap. Fuel up with food that makes you feel good. This may be easier said than done when the only thing that sounds good is a greasy pepperoni pizza, but find a way to complement those cravings with something healthy. Green smoothie, perhaps? 7. Getting antsy? Socialize. Schedule lunch dates with friends who work. Visit other moms with babies. Call your mom. 8. Can’t rest anymore and don’t feel like leaving the house? Start a project. Or three. I worked on a children’s book for E. I made a collage out of shower cards. I prepared intricate meals to keep in the freezer for after she was born. Releasing creative energy helps take the anxiety out of waiting for those contractions to get real. 9. Be willing to say no. I remember turning down a friend’s birthday party and cancelling a girl’s night and feeling really disappointed. In retrospect, I didn’t have the energy for those things and it turns out I was only days away from delivering, (I thought I had weeks left). Listen to your body. If you’re exhausted, don’t go out. 10. Above all, be kind to yourself. Let go of any expectations that you’re supposed to be doing any of the above. If you don’t feel like it, don’t, if you do, do. Sounds simple enough, but those last few weeks of waiting are one of the strangest stretches of life. Everything moves in slow motion. As annoying as it is to hear when all you want is that baby, make the most of it. There will be plenty of (wonderful) time with baby soon enough. Anything I forgot to mention? What advice do you have for parents about to have their first baby? It’s time to push and some of the nurses are switching shifts. One says there is a beautiful, light rain falling outside and I look, the dawn sky letting a little light in through the window. I knew you’d come in the rain. I am soothed by this omen. Each contraction brings another chance to push you out, to see your face and touch your skin to mine. I give everything I have, again and again, until I am certain I only have a couple left in me. I have to get you out on my own. I have worked so hard not to have an epidural, not to waste a single ounce of energy in bringing you into this world. I was already pretty tired before the Pitocin went surging through my veins, leaving a fuzzy feeling all over my body. Five nights of prodromal labor, darkness bringing the rhythmic pains, the excitement of a moment finally coming, contractions 12, 8, 6, 4 minutes apart, then the light taking it all away again. Your water broke long before they induced me. Five days. Your Grandma Cathy says the weather did it, a magnificent thunder storm. It was not the overwhelming burst of water seen in movies, but instead a trickle, easily confused with all the other pleasant end-of-pregnancy symptoms. I did not go to the hospital then, I expected contractions to follow, and they did, but then they stopped at dawn and everything seemed fine again. Besides, I knew a small, or high leak, was considered common in the home birth world, nothing to worry about if the steps are taken to avoid infection. We closely monitored the situation and kept waiting for nature to take its course. Each day I would sleep the best I could and each evening the contractions would come again, teasing me with the prospect of imminent delivery. After five nights of this dance, the contractions growing to the point where I would moan and rock on the floor, my watch cued to time and hope, I reached my edge. It was time to go to the hospital. Sure enough, my water was mostly gone. You were safe, still, but it was time for you to come out. When the midwife told me they would have to induce, tears poured out. I wanted a natural birth for you. I had heard Pitocin horror stories of more painful contractions and one intervention leading to another until a C-section was necessary. The midwives and nurses were so kind, though. They encouraged me with stories of otherwise unmedicated births with induction. An almost natural childbirth was still possible. I cried and regained my resolve. Your dad and I walked around the hospital courtyard, me in my goofy, oversized gown, while we waited for your doula, Heather, to arrive. The air was cool, but I was running on so much adrenaline, I didn’t mind. Your dad stopped and held me. He was so excited to meet you. We were standing at the very top of a long roller coaster. Heather arrived and reassured us the small dose of Pitocin would be alright. By 7PM, it was pumping through my veins, the contractions returning as they had each night, regular and strong. “Is this what they felt like at home?” the nurses would ask. “Not quite,” I answered for some time. Before everything became too intense, all your cheerleaders arrived, a whole waiting room full of family eager to meet you. Your grandparents, godparents, and Aunt Kaitlyn spent the entire night on those uncomfortable fold-out chairs, supporting you with their laughter and lullabies from afar. For a few sweet minutes, they all came in and sat with me, their love so strong I cried as they each stopped to kiss me good-bye between contractions, my body rocking back and forth on the big red yoga ball. Your grandfather James, as he is apt to be called, made me cry the most, his words so tender they burst my heart. 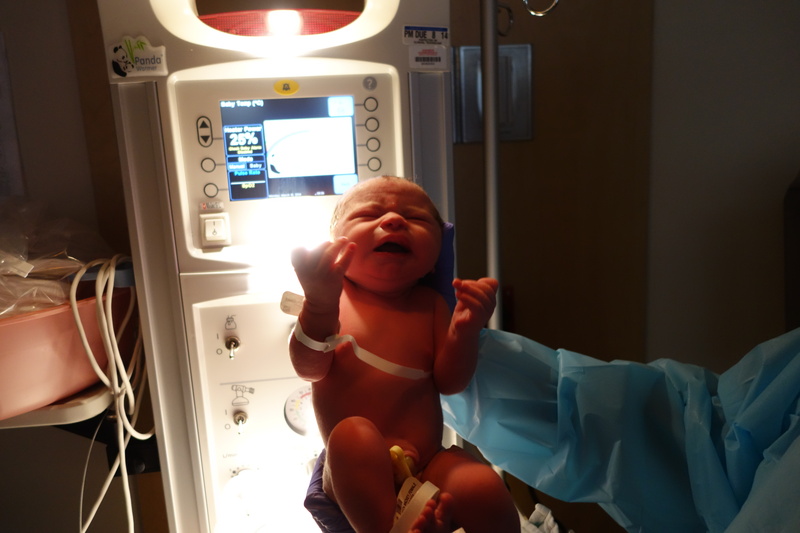 However, much to the chagrin of your big, beautiful, loving family, I needed space to get you out, space to curse and chant, and lose my modesty in the dimly lit shower and delivery room. And, boy, did I curse. “Oh f***” was my favorite phrase. Your kind, patient, powerful doula sat with me quietly through it all with reminders to surrender, no matter how painful. Your father’s touch, his hand still on my thigh, calmed me. Sometime in the middle of the night, I began to talk to myself, yelling “I surrender” to the universe over and over again, in hopes someone would hear me. Periodically, a nurse would tell me someone from our family was hovering outside the door, concerned over all the noise, desperate for news of your arrival. They kept vigil as I moaned and cursed and chanted through the night. I questioned my ability to keep going without drugs, the pain in my lower back and hips unbearable as they opened with each wave. Maybe some people really do achieve a pain-free childbirth, but even if you call pain something else, it hurt, a lot. Your doula gave me strength in her words and presence. Had she not been there, I might have caved. That’s the funny thing, though. Caved is not the word. I have a new respect for all types of birth, medicated and otherwise. Each journey is different, and even if I had chosen an epidural, I would have still done an incredible amount of work to get to that point. Birth and parenthood is an enormous mental transformation no matter the path. I get that now. Still, the promise of transition kept me going. I did not want a single drop of pain killers to slow me down. I needed you out of me, I was tired and quite certain I did not have an ounce of strength to waste. Transition promised change and by a little after six in the morning, I was ready to push. I thought you would come quickly, you were so low and close in station two, but my body had other plans. Maybe I had not surrendered enough yet. Two hours of pushing with everything I had and then magically, your original midwife from all our office visits appeared, the third change in shifts since we began. Her retro Vans announced her arrival behind the curtain. That’s when the nurses mentioned rain and somewhere I found my last reserve of energy, now was time. Heather and your dad sat at the foot of the bed, amazement on their faces as the hair on your head emerged. The midwife climbed onto the edge of the bed and three nurses held my legs, everyone working together to get you out. A few more pushes with this extra help and I felt your head, your shoulders, your wiggly body tear into this world, shock and the most intense pain I could imagine. You were finally here, wet and warm against my bare chest, tears in your fathers eyes and mine. While we bonded, staring in disbelief at all your perfect, little features, I felt more connected to your dad than I have ever felt in our nearly 14 years together. You are our glue, our little miracle, the love that has ripped our hearts open in a way I could have never understood before. Even two weeks later, your dad and I cry and smile in disbelief– a joy so intense, the happiest moments of our lives thus far. But, with this happiness has also come the pain of surrender as we have turned our hearts over to you. We have already had our scares as new parents, our extra nights in the hospital, our worry over all the little things. Surrendering is difficult, but you are here to teach us new lessons and we are ready to learn with our hearts grateful and ready to receive. You are our greatest blessing, Eloise Claire. To say we love you is not enough.